After a long-awaited night, the results of the 2018 midterm elections are in and the determination of Colorado’s state-wide leadership has been decided. The Colorado Secretary of State’s (SOS) office is reporting as of the morning of November 7,2018, that votes have been counted and the following races have been called based on majority percentages. As of November 7,108, total active registered voters were counted at 3,900,192. With 51% reporting, records indicate 1,973,369 ballots have been casted. Final numbers on active registered voters and actual votes cast by party affiliation will not be available until after this report. As of now, this report will reflect the most recent result reporting by the Colorado counties. The story of the 2018 Colorado mid-term elections is the independent voter under the age of 45. This voter leaned Democratic but rejected ballot issues typically supported by Democrats. What we saw versus numbers in the 2014 mid-term elections was significant growth in Independent voters. Republicans also entered the 2018 election with a serious deficit in voter registration compared to Democrats, who had been busy growing their voter registration by 50,000 + voters. The growth in Independent voters under the age of 45 has increased dramatically – and this group typically votes late and not necessarily along party lines – though the growth in Independent voters leans Democratic. This group is determining future elections in Colorado – unless Republicans can figure out how to register more voters and moderate their message and communication in the future. A look inside the state elected offices, the state legislature, and the 2018 amendments and propositions can be found in this report as results continue to roll in. If there is one thing that can be certain, the 2018 primary election was highly contested in both parties, with 15 primaries faced off to compete for the Colorado House of Representatives. Nine Democratic and Six Republican primaries were held this summer with 4 seated Republicans challenged. Two of the four incumbent primary races were lost by the sitting state representatives (HD 47- Otero County & HD 57 Adams County). All 65 House Districts were up for grabs on election night as 45 incumbents faced re-election. Before election night, it was seen that we would only see 20 new faces in the House due to termed-out legislators, primary loss, or the vacating of a seat. In 2018 after the Democrats losing a seat mid-session (HD 35 – Thornton), they held the majority by 7 seats. As of 10:00 am on 11/7/2018, the Colorado Secretary of State’s office is reporting that the Democrats picked up 2 House seats and regained their lost HD 35-Thornton seat. Here is where it gets interesting. 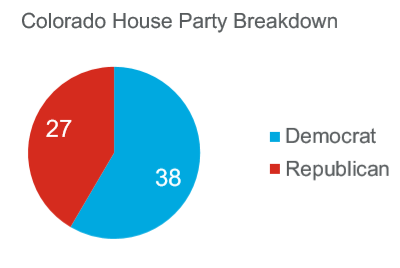 As of the most recent reporting, Democrats lost HD 50 held by Democrat Representative Dave Young (Greeley), but picked up 2 seats HD 25 (Rep. Tim Leonard -Evergreen CO) and HD 37 (Cole Wist – Arapahoe County) This now increases the Democrat majority by 11 seats. 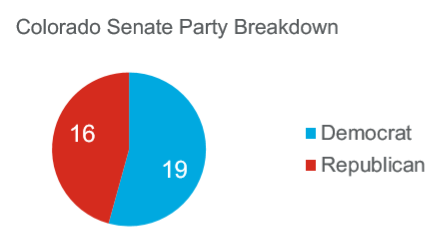 This election cycle, nearly half of the Senate (17 Seats) were up for re-election, giving the Democrats a chance at picking up seats in districts where unaffiliated voters are considered strong. In order GOP to have maintained control, they would have needed to Senate District 24 (Northern Adams County) red and with any luck, flip another highly competitive seat such as Senate District 20 (Western Jefferson County) or Senate District 16 (Northern Jefferson County). hat most predicted that would have major impact and would determine the fate of the majority and who would control the Senate in 2019. It is safe to say that that all was left on the field this election. It has been said that Senate District 24 (Northern Adams County) was the mostly watched and most expensive Senate race with the Senate Districts 16 (Northern Jefferson County) and 20 (Western Jefferson County) to follow. The surprise of the evening was to see incumbent Senator Tim Neville of Jefferson County lose his seat to Democrat Tammy Story by a little less than ten-thousand votes. Description: Amendment A will remove language from the state constitution that allows slavery and involuntary servitude to be used as punishment for the conviction of a crime. Proponents, including Abolish Slavery Colorado, argue that the constitution should be updated because it represents a time much different than today. Description: Amendment W will change the ballot format for judicial retention elections. This essentially condenses repetitive information and will display an easier format when voted for judge or justice retention. Description: Amendments Y&Z will allow independent commissions to draw electoral districts for state legislators and members of congress. Proponents argue that this measure will take politics and partisanship out of the redistricting, increase transparency and give unaffiliated voters a seat at the table. Under both Amendments, newly created 12-member commissions that would approve new districts. They would be equally divided between unaffiliated voters and the state’s largest political parties–currently Democratic and Republican. Description: Proposition would reduce and cap the annual percentage rate (APR) a payday lender could charge and expand what constitutes unfair or deceptive trade practices. Proponents argue residents are paying too much for small loans, and can end up borrowing money to pay off existing loans. Opponents worry about the elimination of payday lenders all together should consumers go more for traditional types of credit. Description: Amendment 73 would have increased funding for public schools in Colorado by changing the state’s tax system. The Measure would/will raise the individual income tax rate for those with a taxable income of $150,00 or more, increase corporate income tax, and change property tax rates. Amendment 73 would/will generate $1.6 billion of new revenue in 2019-20 school year. Description: Amendment 74 would have required state or local government in Colorado to compensate a property owner if a new law or regulation reduced the fair market value of his or her property. Proponents included the Colorado Farm Bureau and the oil and gas industry. Opponents include the Colorado Municipal League. Description: Amendment 75 would have relaxed some state campaign contribution restrictions if a candidate in a given race gave $1 million or more to his or her campaign or third-party committee. Proponents say it would help level the playing field between wealthy candidates and others. Opponents worry that the measure would further complicate the state’s campaign finance system. Description: Amendment V would have lowered the age requirement to serve in the state legislature from 25 years of age to 21 years of age. Description: Proposition 109 would have directed the Colorado Department of Transportation (CDOT) to issue $3.5 billion in bonds for more than 60 road work projects across the state. The measure differs from Proposition 110 in that it would NOT raise taxes or fees, and does not include any money for public transit. It also forces the legislature to spend more on highway projects at the expense of other state programs. Opponents say the measure fails to address ongoing maintenance costs and spends too much on debt servicing (the state would end paying $5.2 billion for the $3.5 billion it would borrow). Description: Proposition 110 would have increased Colorado’s sale tax from 2.9 % to 3.52% and allow the state to borrow up to $6 billion. The $767 million generated annually would go toward a variety of road, transit, pedestrian, and bike projects that Proposition 109 does not address. The measure differs from 109 in that it raises taxes, allows state and local governments to choose which projects to pursue, and includes money for multimodal transportation projects. Opponents say that the state should cut other programs to spend more on transportation. They also say it spends too much on multimodal transportation and relies on a sales tax, which they say disproportionately affects low-income residents. Descriptions: Proposition 112 would have required any new oil and gas development not on federal land to be set back at least 2,500 fee from homes and “vulnerable areas” like playgrounds, lakes and rivers. Proponents say this is a safety measure and gives property owners greater certainty about new locations. Opponents argue would eliminate new oil and gas activity on most-federal land in the state and would cost the state jobs. State and local governments would also receive less in tax revenue should it pass the opponents believe. As a bipartisan team dedicated to solutions oriented answers for our clients, we see great opportunity in the days ahead. Our relationships are consistently bipartisan and we always see opportunities to work together. Since the Great Depression, midterm elections are typically swing elections and this one is no different. In 2010 and 2014 Republicans had huge gains in response to President Obama’s Agenda even though Obama overwhelmingly won his second presidential election in 2012. Colorado went for Hillary Clinton by 5% in 2016 even though President Trump stunned with a winning election. Nationally and in Colorado that swing toward Democratic control was to be expected however, in Colorado’s elections the Democratic Party ran good campaigns and largely spoke to independent voters to gain an overwhelming lead in Colorado. Republicans have to realize that voter registration and reaching independent voters with a message that resonates with their concerns is paramount, if Republicans are to remain competitive in the future. Historically, when Democrats have controlled all branches of Government, they have over played their hand legislatively which has created a backlash from voters and recall elections. Stakeholder inclusiveness, and a bipartisan approach to Colorado’s challenges is of the upmost importance moving forward in 2019. Rural Colorado legislators will continue to be very important in in any legislative process in the future. Their challenges do not go away no matter which party is in control. Colorado has enjoyed tremendous growth and a booming economy in the past 8 years. Colorado’s transportation needs in the legislature must be front and center if Colorado is to remain a vibrant state. All issues are local. Local control, home rule, local growth play an ever-increasing role in Colorado’s future. We see great opportunities in the days and months ahead for innovation and great ideas coming together to prosper Colorado. We look forward to working with you as a new year approaches. Do not hesitate to call us with any questions or concerns we are here at your service.